Character. Cost: 6. STR: 11. 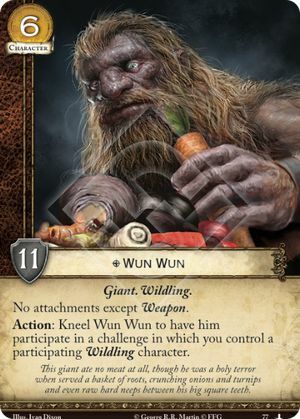 Action: Kneel Wun Wun to have him participate in a challenge in which you control a participating Wildling character. This giant ate no meat at all, though he was a holy terror when served a basket of roots, crunching onions and turnips and even raw hard neeps between his big square teeth. Stealth or other “cannot be declared as an attacker/defender” effects (e.g. Mole’s Town, Grey Ghost) do not stop Wun Wun from participating with his ability.